Rotorua, the Mountain Biking Capital of New Zealand is home to world class Mountain Biking Trails with something to cater for all levels of rider, from beginners and family groups through to experts looking for extreme action! Just a 5 minute ride to world class trails, Sport of Kings Motel has everything you need to make your riding even more enjoyable. With a mountain bike wash down area, secure storage for your bike, drying room for the wetter days and a heated outdoor swimming pool and spa pools to relax those overworked muscles, everything you need to ensure your Mountain Biking holiday in Rotorua is one to remember!! Just a few minute’s ride from Sport of Kings Motel, Whakarewarewa Forest, known to locals as “The Redwoods”, has more than 100kms of master crafted trails, unbeatable riding surfaces, well draining volcanic soils, varying topography and fantastic scenery, a diverse playground for everyone to enjoy. Skyline Rotorua is home to New Zealand's first year round Gondola assisted bike lift, accessing world-class downhill mountain biking. Skyline Rotorua MTB Gravity Park gives riders easy access to an 8.5-kilometre trail network featuring trails with varying terrain for all ability levels. Soak up the scenery cruising down Simple Jack, or see the trees as a blur as you rip into steep techie terrain on Ten Fifty One. The Skyline gondola takes the hard work out of the park’s 368-metre vertical rise. The dedicated gondola cabins are designed to take up to four bikes and riders. 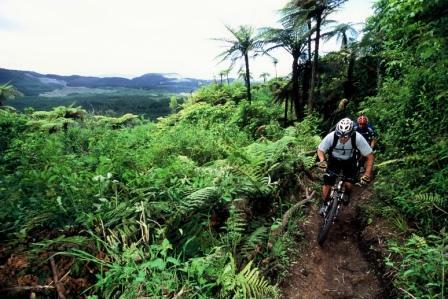 Click here to download a map of the Skyline Rotorua Mountain Biking Trails. If you are in Rotorua without a bike, we can help you experience some amazing tracks on a top quality, newest season bike from a range of different bike makers. Please feel free to contact us if you need any information regarding hireage, pricing and what is on offer.